In keeping with the shorter size of the new Provari Mini, here is a mini review of it. The Provari Mini electronic cigarette has all the great features of the original Provari, only in a shorter, lighter form factor with a correspondingly shorter battery life. So there you have it, if you’re familiar with the well respected Provari, you need read no further. For those looking for a little more substance in a review, we’ll be happy to oblige. The Provari Mini is a great looking device that takes many of it’s design cues from its larger sibling. 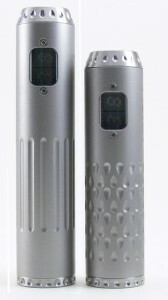 The top and bottom caps are identical as is the stainless steel construction of the tube. The bottom cap, including the extended cap, are interchangeable with the larger Provari. The tube on the mini is machined with a very nice looking alternating teardrop design where the standard Provari has parallel flutes. Length and weight are the major differences that set the two apart. The Mini measures 3.48″ compared to the 4.13″ of the larger Provari and at 4.45oz with an 18350 battery installed, the Mini is .9oz lighter than a Provari with the standard 18490 battery. Even with the smaller size, the Mini still gives the impression of solid quality and everything fits together perfectly. No discussion of a Provari electronic cigarette would be complete without a nod to the exceptional electronics and the Mini is no exception. The microprocessor and display are the same as found in the V2 version of the larger model, meaning that regulated variable voltage from 2.9 to 6 volts is available, with a current limit of 3.5amps. Both Provaris boost the output of a single battery at a claimed 95% efficiency. Changing the voltage is still accomplished with a series of presses on the single button which also fires the atomizer. Additional button presses turn the device or just the button light on and off, measure battery voltage and test atomizer resistance. A nice list of safety features is also controlled by the microprocessor, from overcurrent protection to low battery detection as well as a 16 second cutoff. Details on accessing the button functions can be found in the Provari manual available for download, but suffice it to say that this single button is perhaps the only negative feature on this device. Having only one button makes for a very clean appearance and the size and feel of the button are excellent. But a single button also means that multiple presses are the only way to tell the microprocessor what to do. Pressing the button 5 times activates the menu and additional double presses cycle through the options. Waiting a few seconds on any option allows that option to be changed, and waiting a few more sets it. In practice, pressing the button 5 times and waiting for 3 seconds to change the voltage is no bother, but 9 button presses, a 3 second wait and one more button press to turn an electronic cigarette off before putting it in your pocket can get a little cumbersome. In use, the Provari Mini gives the same satisfaction of the larger original in a slightly more portable size. The feel of the device is substantial, but easy to hold and use. Of course, the regulated voltage means that the perfect vape can be had from just about any electronic cigarette cartomizer or atomizer. I really like the look of the shorter form with the new super shorty 1.7ohm cartomizers that are available and the 3.5amp limit means that an excellent warm vape is produced. Of course, the smaller 18350 battery is only rated at 700mAh versus the 1100mAh of the standard 18490 of the larger Provari, meaning that time between charges is reduced substantially. Still, with the efficient boosting of the Provari circuitry, two batteries may be enough for a day’s worth of moderate vaping. 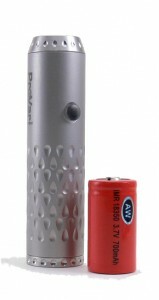 An extension cap allows use of the larger 18490 battery, but in doing so increases the size of the mini to that of the larger Provari. There honestly wasn’t much to improve upon with the original Provari, as a loyal following of users will surely attest. Rather than mess with the formula, Provape has introduced a model that simply gives users another option. At the same base price of $159.95 as the larger Provari, the Provari Mini offers just what the name suggests, a slightly smaller Provari. Nothing besides battery capacity is lost, and that’s a good thing.